Most of the commentary I see about fixed-mobile substitution tends to be highly partisan - usually sponsored by companies with something to prove. So it's quite refreshing to see a genuinely independent piece of research from an unlike source - the US Center for Disease Control, which asked about phone use in its ongoing health surveys, I guess primarily to ensure that emergency calls can be dealt with appropriately. 16% of US homes are mobile-only (but this being the US, cable connections are usually considered separately and not considered 'fixed' lines). This number has been increasing consistently. 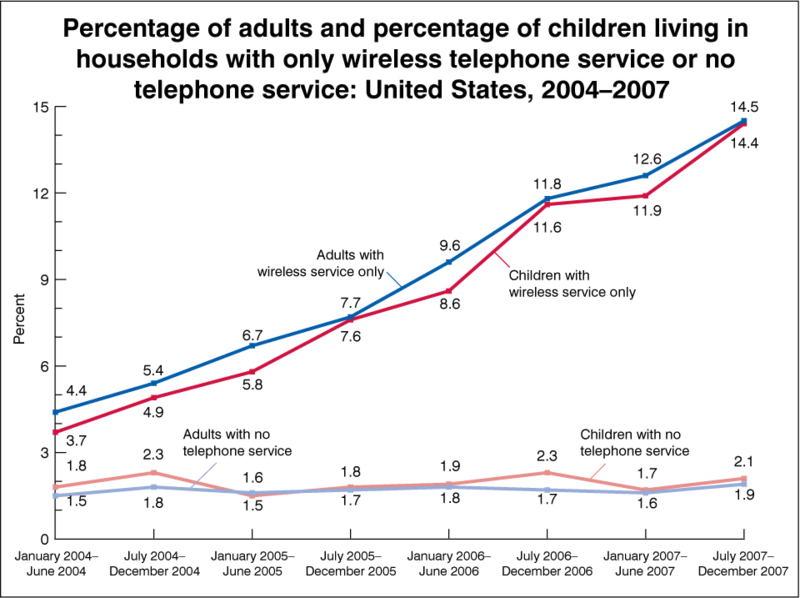 And another 13% of US homes receive most calls via mobile, even though they have a PSTN line. And 2% have no phone service at all. But the most interesting facts are in the demographic analysis. Perhaps unsurprisingly, shared-adult homes (eg students living in the same household) are very high on the wireless-only scale, compared with families. Similarly (and probably overlapping) renters are more wireless-centric than homeowners. And there is also a preponderance of low-income and ethnic members of this category. This data looks pretty similar to stats I've seen from Ofcom in the past about the UK. What it tells me is that despite the hype, "cord cutting" is not really an aspirational thing at all - it's more driven by circumstance (economic or social). Oh, and I love the statistic that wireless-only users are more than twice as likely to binge-drink than landline customers. Now if only someone had an explanation for cause-and-effect here.... does dealing with mobile customer service agents drive you to drink? Or do people cancel their landline subscription when they're drunk, and wake up in the morning wondering what happened to their dialtone? Clearly, if femtocell suppliers really want to facilitate FMS, they need to forget about home gateways & instead integrate their modules into one of these. Or maybe landline users just can't get a cable long enough to reach their local bar! An interesting regular survey identifying a clear trend. Those FMC (rather than FMS) intiatives won't address this part of the population. Definition of a binge drinker: (i.e., having five or more alcoholic drinks in 1 day during the past year) - I'm surprised this was only 37% of respondents. Even so it seems a bit of a strong measure (no pun intended). Wireless-only adults (47.6%) were more likely than adults living in landline households (34.7%) to have ever been tested for HIV, the virus that causes AIDS. Seems a bit high to me. The conclusion seems to be that the US population spends far more time on one-night stands than down the pub getting blind drunk like their UK cousins. On a more serious note, since Cable is not taken into account, many of these homes could still have some form of broadband internet whether via Cable or DSL. Be nice to see some stats on that and if there is any correlation. Interesting article, especially the bit that a consistent 2% of people have no connection at all. What are the demographics there? Poverty, or age? With all due respect, Dean, the comment that "cable connections are usually considered separately and not considered 'fixed' lines" was pretty careless. The initial purpose of these studies was for the CDC to understand whether its surveys, which are conducted using randomly-generated landline telephone numbers, have been biased due to the growing number of wireless-only households. If you check out page 2 of the early release of the report (http://www.cdc.gov/nchs/data/nhis/earlyrelease/wireless200805.pdf), you can see that the survey question distinguished between a cell phone and any other working phone inside the home. Cable and even over-the-top VoIP would clearly fall into the landline category.